We love wood fired cooking and we know our valued customers do too! There is an explosion in wood fired ovens being bought and sited into private gardens across Cheshire and the wider North West. This centuries old cooking tradition still inspires aspiring home based chefs to fire up and attempt to provide delicious food for their friends and families… sometimes successfully but more often less so! 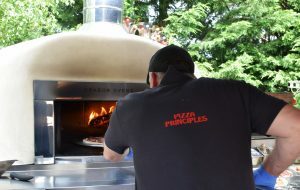 At Pizza Principles we share our love of wood fired catering not only by turning up and turning out delicious wood fired cuisine but increasingly through our dedicated workshops at our Bollington commercial kitchen for budding wood fired chefs. In a fun, collegiate environment we offer a range of 1 and 2 day courses covering all aspects of wood oven operating techniques and skills, dough making and management, through to wider full service catering methods and wine pairings, giving the home wood oven chef the skills to fire-tickle the most delicious Mediterranean menus in their wood ovens in their own back gardens. Our Wood Oven Workshop will allow you to WOW your family, friends and guests every time you light up your oven! Get in touch for 2017 winter Wood Fired Workshop dates and discover a whole new world of delicious wood fired catering… great present for your loved one!